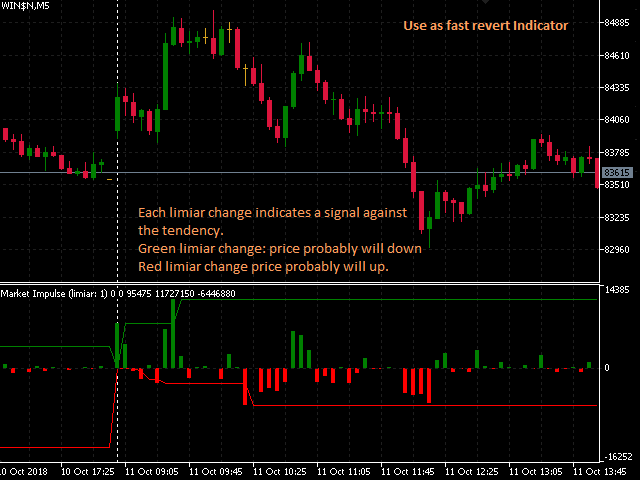 This indicator uses volume and volatility information to indicate the trend or to indicate the market reversion/correction. There are 2 indicators in one. 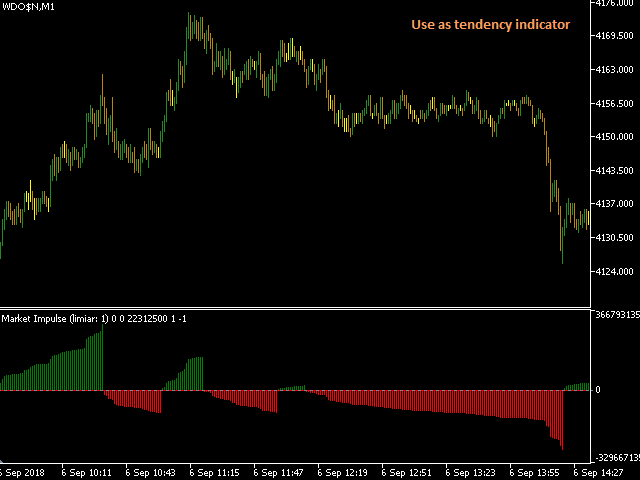 The indicator works in two styles: values ​​per candle and accumulated values. Using the volume and volatility information, when well adjusted, this indicator has a good probability to indicate the right direction, both in lower (M1, M2, M5) and higher (M15, M30) timeframes. "Update threshold when breaks": "No"
Verify if you can easily identify the trends. Otherwise, gradually increase the "Accumulation flip threshold" until be ok.
With this configuration, the indicator will indicate the saturated points of the market with a higher probability of retraction. 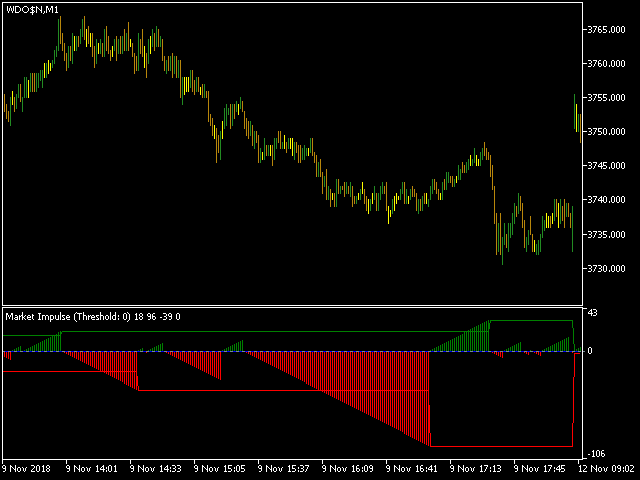 This strategy works better using lower timeframes (M1, M2, M5). "Update threshold when breaks": "Yes"
Whenever the negative (red: Limiar -) or positive (green: Limiar +) threshold line increases, probably the price will turn on the direction (or by a reversion or by a correction). By example: If the positiv threshold raise, should be a good momente to sell and close this position some candles ahead. The other parameters serve to allow a finer adjustment for both strategies. Applied to: Which candle params to use to volatility. Update threshold when breaks: Will the threshold be changed when the bar raise the value? Accumulate values: Toggle to accumulate consecutive same direction volatility values. Accumulation type: Used only when Accumulate values is on. Accumulation flip threshold: Max volatility value that the indicator tolerates to put a reverse volatility in the current accumulation. Used only when "Accumulate values" is setted to "Yes"
Show balance line: Works only when Accumulation type is Normal. Programmers: This indicator was optimized for use with expert advisors, it does not redraw! EA should wait for the candle to close. Do not act upon incomplete candles (otherwise the EA may act on a false signal). 1. All parameters changed to English.